U.S. Supreme Court ruling: thanks to Southern Baptists and Mennonites for upholding traditional Catholic moral teaching! A cursory reading of the Instrumentum Laboris for the upcoming Synod on the Family does not inspire confidence in the working proceedings of the Synod itself. It is heavily dosed with orthopraxis jargon in a catena of the results of the questionnaires that were solicited from both clergy and laity. 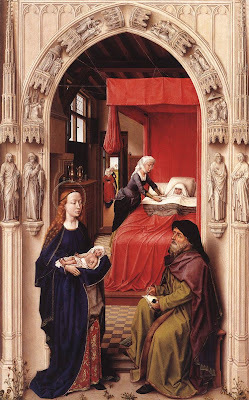 But the Instrumentum quite rightly asks the question of how the Church should teach about and to the Catholic family in a secular age that no longer responds to the vocabulary and imagery of a Christian world-view. A writer for this blog recently expressed here his unease about paragraph 30, in which is discussed the need for the teaching on Natural Law to be updated and made meaningful to Catholic families and to the non-Catholic world as well. "Catholic, evidently": 20 new priests! Congratulations to the new priests of the Society of Saint Pius X (SSPX / FSSPX) ordained in the month of June! 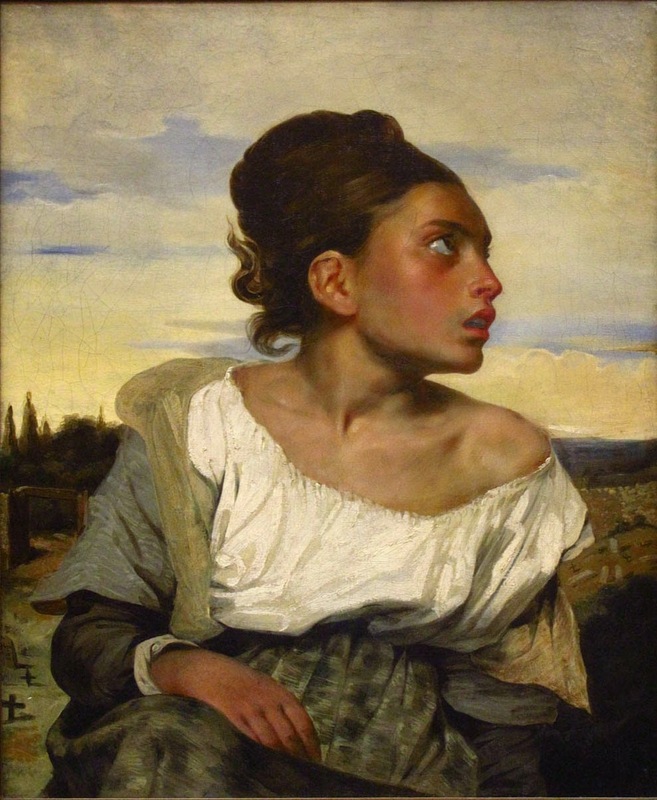 When confronted with the undeniable evidence of the decline of Catholicism on so many levels, especially in Europe and North America, one favorite tactic of many "conservatives" and some "liberals" is to point to the state of Catholicism in Latin America, Africa and Asia, where the faith is assumed to be vibrant, unaffected by secularism and modernist compromises, and increasing in followers by leaps and bounds. If one counts the number of those baptized in the Catholic faith, then undoubtedly the numbers continue to be excellent; never before have there been so many baptized Catholics including in North America and Europe. The problem is that the number of baptized Catholics has little relation to the actual state of Catholicism anywhere: otherwise secularism would be an unknown phenomenon in countries where most citizens have been, at one point in their life (usually at infancy) baptized in the Catholic Church. The question of how many of those who have been baptized in the Church retain their self-identification as "Catholics" is a more important indicator when measuring the true vigor of the Church in any given country. It is the ultimate hypocrisy to lament and criticize, as do so many Catholic pundits and "apologists", the lack of catechesis and poor formation of the vast majority of nominal Catholics, and then turn around and point to the sheer numbers of the same nominal Catholics as proof that all is well and the Church remains in excellent shape. When it comes to Latin America, Catholicism has been under serious and sustained siege from Evangelical Protestantism and the secular unbelief since the 1980s. Just how serious the losses have become are revealed in Corporación Latinobarómetro's latest survey of religion in Latin America, released on April 16, 2014: "Las religiones en tiempos del Papa Francisco". Understandably for a document released to honor the first year of the pontificate of the first Latin American pope, the study has an upbeat tone in the introductory remarks about the strength of religion and of Catholicism in Latin America. Nevertheless the graphs and statistics present a wholly different story, at least as far as Catholicism is concerned. The percentage of self-identified Catholics slightly increased in Mexico (the notable exception) and the Dominican Republic but dropped everywhere else, with the most precipitous declines recorded in Nicaragua (a drop from 77 to 47%) and Honduras (from 76% to 47%). These countries went from being overwhelmingly Catholic to being majority non-Catholic in less than a single generation, along with countries such as Guatemala (which saw a drop from 54% to 47%) and Uruguay (from 60% to 41%) where the hold of the Catholic faith was already in peril as of 1995. 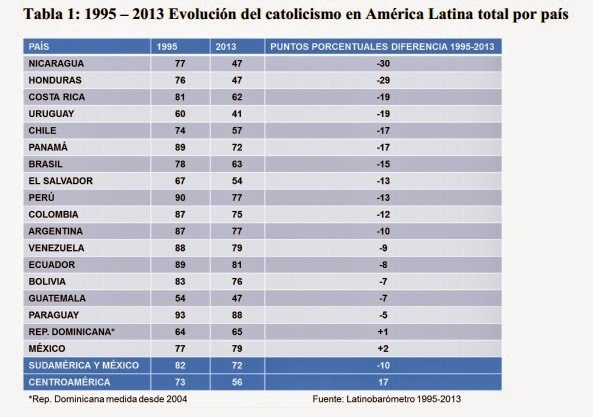 As noted at the bottom of this table, South America and Mexico went from 82% Catholic to 72% Catholic in 18 years, while Central America (Guatemala, El Salvador, Honduras, Nicaragua, Costa Rica, Panama and, for the purposes of this study, the Dominican Republic) fell from 73% Catholic to 56% Catholic in the same time frame. The following chart (from p. 7) arranges the countries of Latin America in terms of the percentage of Catholics, from the largest to smallest. As seen from the first chart, all of these countries had been majority Catholic in 1995. Today, four are majority non-Catholic while another two (Chile and El Salvador) are on the edge. It is telling that Honduras, Nicaragua, El Salvador and Guatemala are the countries where Liberation Theology and the alliance of Catholic religious and clerics with the Far Left were most pronounced in the 1980's and 1990's. The collapse of Catholicism in Honduras also occurred entirely during the tenure as Archbishop of Tegucigalpa (1993 to the present), of its leading prelate: Óscar Andrés Cardinal Rodríguez Maradiaga SDB, currently the coordinator of the "Council of Cardinals" and one of the most influential architects of the current Pontificate's policies. The situation of Uruguay is of special interest in that it has always been at the vanguard of "social progress" and secularization in Latin America, and doubtless gives us a glimpse of what the future will be like for Latin America if the process of secularization is not stopped. Uruguay is also culturally very similar to Buenos Aires, with which it shares the same different Spanish accent and the same secularized society. 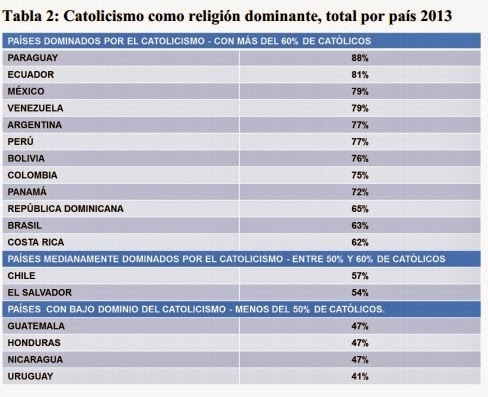 Taken together, according to another table in the same study (p. 4) the percentage of Catholics in the Latin American countries covered in this study fell from 80% in 1995 to 67% in 2013. The decline was steady except for a short lull from 2005 to 2009 and again from 2011 to 2013. 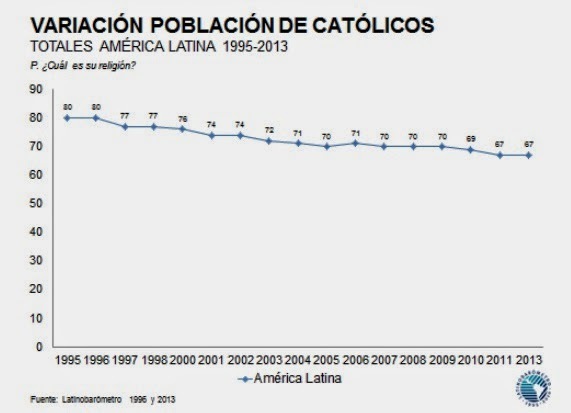 While Catholicism has declined in most Latin American countries, Evangelicalism has grown by leaps and bounds (see the next graph, located in p. 6 of the study). The study claims that as of 2013 Evangelicals accounted for 40% of Guatemalans (as opposed to 47% Catholics), 41% of Hondurans (47% Catholic), 37% of Nicaraguans (47% Catholic), 31% of El Salvadorians (54% Catholic), 21% of Brazilians (63% Catholic) and 21% of Costa Ricans (62% Catholic). In contrast, in 1996, Evangelicals comprised only 25% of Guatemalans (54% Catholic), 12% of Hondurans (76% Catholic), 11% of Nicaraguans (77% Catholic), 5% of El Salvadorians (67% Catholic), 18% of Brazilians (78% Catholic) and 9% of Costa Ricans (81% Catholic). The survey unfortunately bears out what many Evangelicals from North and South America have been boasting about since the 1990's: the mass conversion of tens of millions of Catholics in Latin America to Evangelicalism. This is mirrored in the United States where Hispanics are also defecting in considerable numbers to Protestantism. This is a reality that could no longer be ignored for the sake of presenting Catholicism as the victor in the "numbers game" of conversions to or from Protestantism. It had been almost 50 years since the Cathedral of Our Lady of Chartres (Notre-Dame de Chartres), one of the greatest Christian buildings in the world, had last witnessed the kind of immemorial priestly ordination rite for which it was built in the first place - according to a Traditional Rite of the Latin Church, in almost all aspects identical to the local Western uses employed in it from its earliest days, and the Roman Rite itself in several moments of the Cathedral's history, including permanently from the 19th century onwards. "Extraordinary" - because it is extraordinarily beautiful. Seven years after its promulgation, the Apostolic Letter Summorum Pontificum is, despite all difficulties and resistances to its application, a gift that keeps on giving and inspiring. 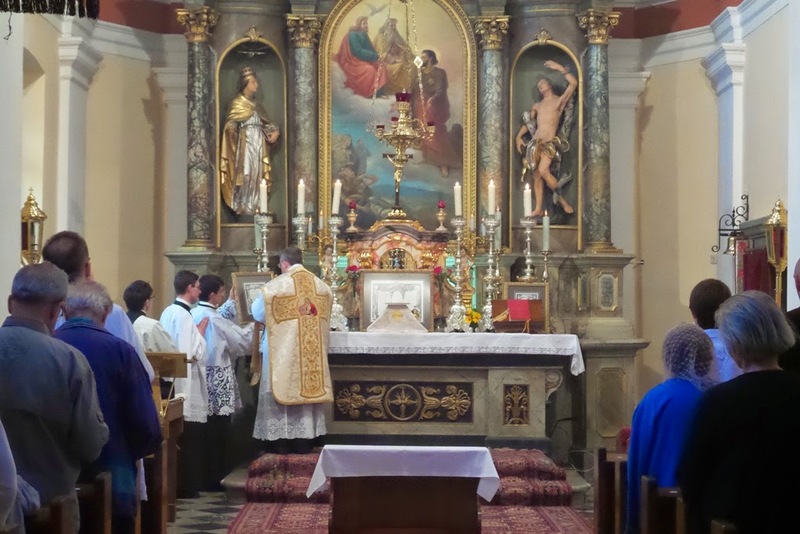 Last Friday, June 20, a votive mass of the Most Sacred Heart of Jesus was celebrated -- a small group of people gathered under the banner of Juventutem Slovenija managed to organize the first post-Summorum public traditional mass in the capital of Slovenia. The mass was said in the district of Dravlje, in the baroque church of Saint Roch. Forgiving your persecutors? Yes, a Christian attitude. "Honoring the king"? Yes, certainly (I Pt 2:17). 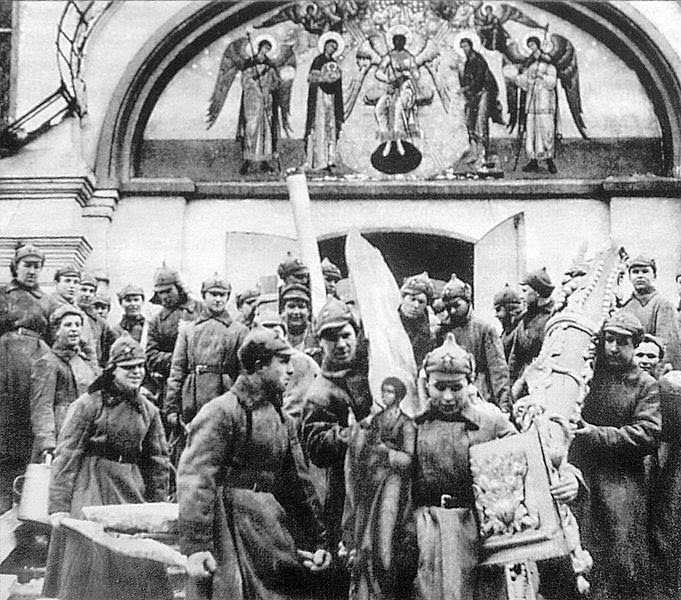 Giving a public prize honoring the leading figure of the organizational successor of the very same unrepentant Atheistic Materialistic Marxist-Leninist-Stalinist political party that martyred as many of your ancestors in the faith as they could and that tried to wipe out any trace of Christianity from your land with cruelty and ferocity unsurpassed since Apostolic times? Well, that is quite unexpected. With all my heart, I wish to congratulate you on this remarkable date. 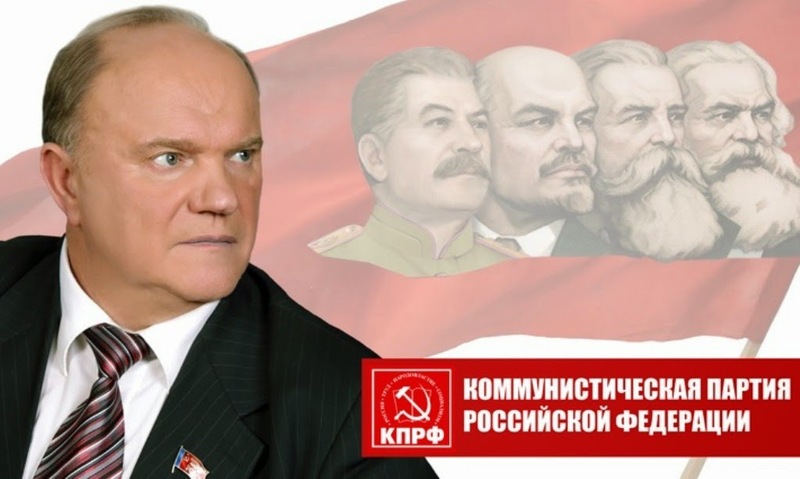 Being one of the most prominent politicians of modern Russia, you seek to care for the people's wellbeing and protect the traditional moral values. I hope that your fruitful activity will continue to promote socially important initiatives and the moral transformation of the society. I wish you robust health, peace, and heavenly aid in all your good deeds and initiatives. I deem it to be fit to award you with the "Order of Glory and Honor", 3rd degree. 2. The "Order of Honor and Glory" is the second-highest of the honorific awards of the Moscow Patriarchate. On the Vigil of Saints Peter and Paul, love for the Church of Rome sanctified by their blood. "You are Peter, and on this rock I will build my church" (Mt 16:18) are the weighty, great and solemn words that Jesus speaks to Simon, son of John, after his profession of faith. This profession of faith was not the product of the Bethsaida fisherman's human logic or the expression of any special insight of his or the effect of some psychological impulse; it was rather the mysterious and singular result of a real revelation of the Father in heaven. Jesus changes Simon's name to Peter, thus signifying the conferring of a special mission. He promises to build on him his Church, which will not be overthrown by the forces of evil or death. He grants him the keys of the kingdom of God, thus appointing him the highest official of his Church, and gives him the power to interpret authentically the law of God. In view of these privileges, or rather these superhuman tasks entrusted to Peter, Saint Augustine points out to us: "Peter was by nature simply a man, by grace a Christian, by still more abundant grace one of the Apostles and at the same time the first of the Apostles" (Saint Augustine, In Ioannis Evang. tract., 124, 5: PL 35, 1973). We seem to hear as addressed to us the words that Saint Ephraem represents Christ as speaking to Peter: "Simon, my apostle, I have made you the foundation of the Holy Church. I have already called you Peter because you will support all the edifices. You are the superintendent of those who will build the Church on earth . . . You are the source of the fountain from which my doctrine is drawn. You are the head of my apostles . . . I have given you the keys of my kingdom" (Saint Ephraem, Sermones in hebdomadam sanctam, 4,1: Lamy T.J., S. Ephraem Syri hymni et sermones, 1,412). ... Our mind re-echoes spontaneously the emotion-filled words that our great saintly Predecessor, Saint Leo the Great, addressed to the faithful of Rome: "Blessed Peter does not cease to preside over his See. He is bound to the eternal Priest in an unbroken unity . . . Recognize therefore that all the demonstrations of affection that you have given me because of fraternal amiability or filial devotion have with greater devotedness and truth been given by you and me to him whose See we rejoice to serve rather than preside over it" (Saint Leo the Great, Sermo V, 4-5: PL 54, 155-156). - "Christian is my name, Catholic my surname." The ultimate criteria of judgment for a Catholic must be the one of the Church: to love and hate what the Church loves and hates: loving the truth in all of its uniqueness and integrity and hating error in all of its multiplicity of expressions. Orthodoxy and heterodoxy remain the final measure of judgment which Christian Reason must be subject to. In 1542, Pope Paul II, instituted the Congregation of the Roman Inquisition, afterwards called the Holy Office and nowadays named the Congregation for the Doctrine of the Faith, with the aim of guarding the purity of orthodoxy. In 1571, Saint Pius V, supported it with the Congregation of Index which had the task of indicating all the books deforming correct Catholic Doctrine. In 2002, L’Index Librorum prohibitorum 1600-1966 was published by the Centre d’Études de la Renaissance at Sherbrooke University, and gathers together all of the condemned works until the suppression of the Index, which Paul VI wanted in 1966. From Protestantism to Illuminism, from Catholic liberalism to modernism, there is not one heterodox writer that has not been singled out and condemned for the good of the Church and for the salvation of souls. The Index established a precious instrument to help Catholics know and detest errors and heresies. 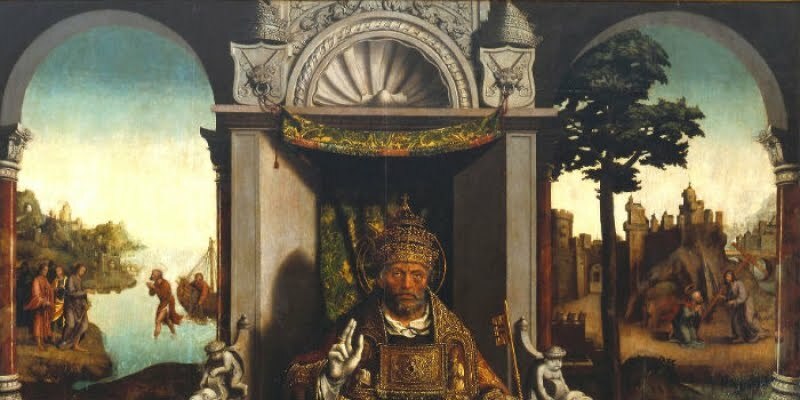 The Holy Office was the supreme tribunal which every Catholic could turn to when they had doubts and perplexities in matters of faith and morals. To the Congregation for the Faith, which followed the Holy Office, we owe, in recent years, a number of notifications, such as Dominus Jesus in 2000 or Considerations regarding Proposals to Give Legal Recognition to Homosexual Unions in 2003. After the disturbing declarations by Cardinal Kasper at the Consistory in February 2014, on the theme of the divorced and remarried, and the equally disquieting document Instrumentum laboris, presented on June 26th, in preparation for the upcoming Synod on the Family, it would be right to expect a clarifying statement from the Congregation (today presided over by Cardinal Müller) about the grave problems on the table in matters relating to the family and sexual morality. Today, however, there is an attempt to substitute orthodoxy with “orthopraxy”. The international theological publication “Concilium” dedicated its latest number to the theme: From “anathema sit” to “Who am I to judge?” starting with Pope Francis’ famous sentence on homosexuality: “who am I to judge,” pronounced during the return flight from Brazil in July 2013. The authors define orthodoxy as “metaphysical violence”. They retain that the formulas and dogmas cannot comprehend historical evolution, but each problem must be collocated in its historical and socio-political context. The concept of orthodoxy must be surpassed, or at least re-dimensioned, since, it is used as “a point of reference to suffocate freedom of thought and as a weapon to control and punish.” (“Concilium”, 2/2014, p.11). The primacy of doctrine must be substituted by pastoral praxis, as Father Juan Carlos Scannone explains, intervening in support of Cardinal Kasper, in the article Serene Theology On One’s Knees found in the “Civiltà Cattolica” of June 7, 2014. 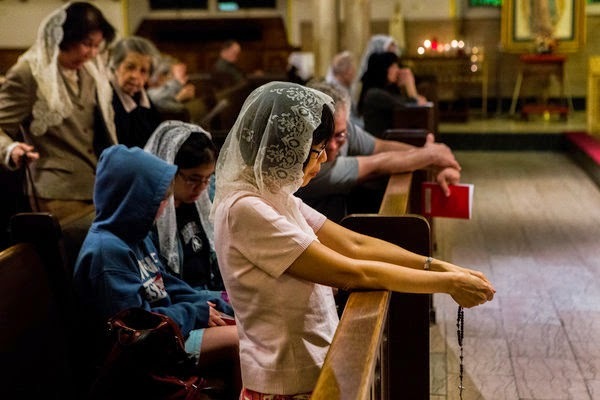 The sad story of the possible closure of Holy Innocents parish in New York City -- the only church to have a daily traditional Latin Mass in one of the largest and most prominent cities in the world -- continues, with two new pieces in the New York Times. Conservative Catholics, generally, have been concerned about where they fit in the church in the era of Pope Francis, with his less doctrinaire style. And many liturgical traditionalists, some of whom simply prefer the old liturgy and music, and others who want to roll back the changes of the Second Vatican Council of the 1960s, are closely watching the situation at Holy Innocents. They fear it may signal a return to a broader suppression of the Latin Mass after a period of being encouraged under Pope Benedict XVI. At Holy Innocents, the Latin Mass helped bring a renaissance, parishioners said. The church, which dates back to 1869 and has about 300 registered parishioners, operates at a surplus, driven in part by generous collections and a thriving thrift shop in the basement, according to church documents. Attendance at Sunday Mass has nearly tripled since 2009, and the church recently paid $350,000 to restore a mural behind its high altar that was painted in the 1870s. Regarding the Latin Mass, Mr. (Joseph) Zwilling (spokesman for the Archdiocese of New York) said that lay groups in the diocese were welcome to organize such Masses but that the diocese did not think a special parish needed to be assigned. He said it was premature to discuss what would happen to the parishioners of Holy Innocents until Cardinal Dolan, who is the archbishop of New York, made the final decisions on church closings in September. The archdiocesan priest who officiated at the Latin Mass at Holy Innocents on a recent Sunday asked not to be identified for fear of retribution. A second piece on the New York Times website also ran today concerning Father Wylie. Rorate reported on Father's termination earlier this month, which revealed, according to the director of priest personnel for the Archdiocese of New York, the dismissal came "directly from the cardinal's office." Rorate has observed that so far there has been no public mention on what would be a win-win situation for Cardinal Dolan and the Archdiocese of New York: inviting the Priestly Fraternity of Saint Peter or the Institute of Christ the King to run Holy Innocents as a personal parish. The archdiocese's arguments on parish closings have been about priest shortages and finances, both of which become non-issues if the Fraternity or Institute are given custody of the parish. In light of the publication of the somewhat vague and suggestive Instrumentum Laboris for the October Extraordinary Synod on the Family, I found the following crystal-clear passages from Frank Sheed's marvelous book A Map of Life to be extremely pertinent. Here, in a book first published in 1933, is how the Catholic Faith used to explain itself -- with clarity, charity, and a deep realism that trusted the Law of God and humbly submitted to it, rather than looking for loopholes, accommodations, and relaxations. Sheed's more famous book Theology and Sanity in a way captures the confident profile of preconciliar Catholicism: true theology is both the cause and the sign of human sanity. If we look elsewhere, or even worse, if we contradict divine revelation and the Church's tradition, we will end up with sheer insanity. As citizens of the United States continue to worry about federal incursions on the freedom of Catholics to practice their faith and even to follow the dictates of the natural law unmolested, American Catholics should be concerned about an even more frightening shift in the ecclesiastical polity, namely, the growing acceptance within the Church, among the faithful and in the hierarchy, of sexual aberrations, libertinism, and antinomianism in all of their forms, open or subtle, whether institutionalized or still private and arbitrary. The Church is the last and only bulwark of sanity against the rising flood of irrationality and perversion. Wherever the Church militant fails on earth (and remember, we have no guarantee of the perpetuity of any local or regional church), all is lost, and no political activism will be able to stand in the breach. Let us pray, then, for wisdom and fortitude -- the wisdom to adhere to the truth given to us by our Lord, and the courage to follow it to the very end, for love of God and neighbor. And let us pray especially for the bishops and the Holy Father, that the Spirit of truth will be with them in October to ground their deliberations and decisions in natural and supernatural sanity. This fact that the essence of sin is offence against the law of God sometimes—in fact most often—misleads the sinner as to the true nature of sin. He imagines himself in a small field, bounded by a fence put there to prevent him from breaking out of the field to sample the rich possibilities of life outside. Here, he says, am I: a being full of the possibilities of development, yet my development is checked at every turn by some absurd law. This view arises from a failure to understand the nature of God’s laws. His laws are no mere whims, like the laws of some stupid despot. They are, on the contrary, the expression by God of His own knowledge of man’s nature and destiny. He knows the kind of being man is, for He made him. And for the same reason He knows what man is made for. God’s laws, then, are a precise statement of how this particular kind of being may avoid destruction and reach his particular goal. The man who makes an engine is not limiting your freedom when he tells you not to run it beyond a certain speed. He knows that if you do you will smash the engine. And if you should plead that your nature demands more speed, that you feel stifled by such slow running—he may very well grow impatient. He knows what speed is right for the engine, for he made it. THE resistance to sin nearly always involves some degree of suffering: in some cases it involves terrible suffering. And there are those who would relax the moral law when the suffering caused by obedience to it appears to be extreme. Now, no one can alter God’s law. Even the Church cannot do that: within the framework of His law she may make what we call by-laws, binding upon her members, but these must be in accord with God’s law, which she cannot change. This point is not always grasped. The Church has received from God the power to make laws binding upon her members. But this power, as I have said, is subordinate to the laws stated by God Himself as binding upon men. The distinction may be illustrated in the case of marriage. The Church cannot grant any of her children a divorce because when they make the contract of marriage (that is to say, agree to take each other as husband and wife for life) God brings into being a new relationship. Now, by God’s act consequent upon their contract, they are man and wife. This new relationship, though it follows upon their contract, is not created by their contract, but by God. The Church can no more make them cease to be husband and wife than it could make a father and son cease to be father and son. But within the law laid down by God, the Church can legislate. It can, for instance, decree that for the marriage of a Catholic, the presence of a priest as witness is necessary. These laws being its own the Church can alter. But she cannot alter the laws given to her by God to be taught to men. Nor does she want to. As the Church recently observed one of the ten universal holy days of the liturgical year, the subject of Holy Communion has naturally come up in different arenas for discussion following the feast of Corpus Christi. 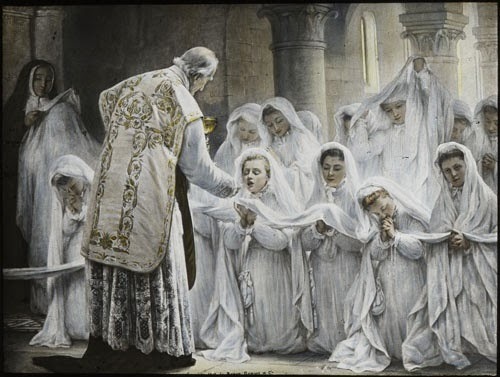 One such blogger, Deacon Gregory Kandra of the Diocese of Brooklyn, New York, wrote a piece that offered guidance to communicants who attend the novus ordo liturgy. In doing so, he inadvertently exposed some of the absurdities of trying to improve decorum and seriousness with the distribution of communion at a liturgy that seriously lacks seriousness. 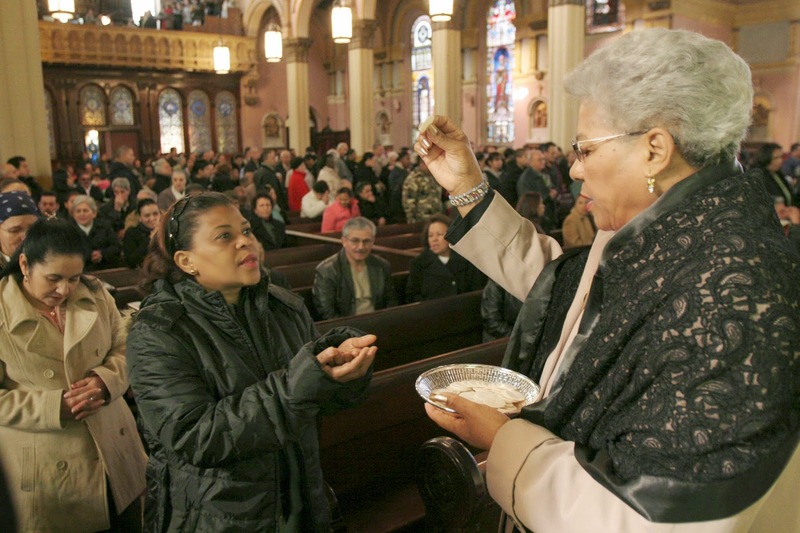 "The Eucharist remains the greatest gift, the 'source and summit' of our faith, and we shouldn't approach Holy Communion like we are standing in line at the DMV." The Department of Motor Vehicles (DMV), for the benefit of our foreign readers, is, in the United States, the state-level government department responsible for the registration of motor vehicles and that administers procedures for driver licensing. 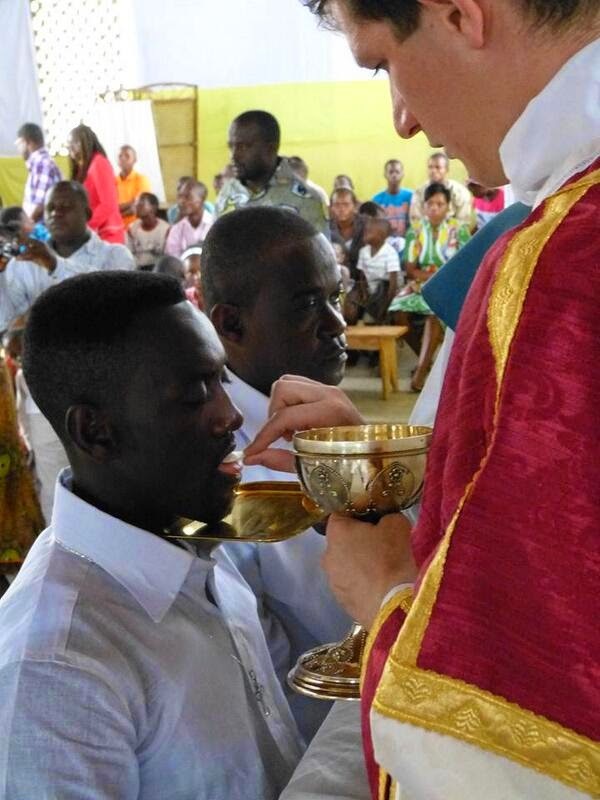 It is important to note that DMV-looking lines only happen to be at locations that predominantly feature communion-in-the-hand (which Deacon Kandra seems to claim as more historically Catholic than receiving on the tongue). And why not? If the end-game is to approach a lady who will place a host in your palm while the communicant stands, then the casual approach is naturally going to become the norm. It took 20 seconds to find this photo from Deacon Kandra's own diocese. Compare the above Brooklyn parish to the Institute of Christ the King's mission in Gabon. Which one is more conducive to belief in the Real Presence? In addition to the parish level, take, for instance, mass Masses. Communion was never intended to be distributed to thousands of people at Mass, even following the reforms and preachings of Pope Saint Pius X. When Francis Cardinal Spellman, archbishop of New York, offered a traditional Latin Solemn High Pontifical Mass at Yankee Stadium in the Bronx in 1957, he alone received communion. The 50,000 others did not receive. The Holy See made available today the guidemap (called "Instrumentum Laboris") of the October Extraordinary Synod on the Family; these are the main paragraphs on the matter of "remarried" and divorced persons -- based on the answers sent by the Episcopal Conferences. "There you go again!" "Poverty? OK, give back the taxpayers' money!" It's like a twofer insult -- mocking what he considers to be the "expressionless" faces of pro-life bishops, priests and faithful who risk it all to pray in front of baby slaughterhouses, plus the gall to use the pro-death shock-free nickname for abortion, "interruption of pregnancy." Quite startling even for extremely liberal bishops. Bishop Galantino has the terrible habit of granting imprudent interviews where he says horrid things, but always only against faithful Catholics, and, after his latest one, the great Italian journalist and author Antonio Socci has had enough. Why all this talk of "poverty" this and "poverty" that, and no question of renouncing the golden tax allocations in Italy? By the Italian system of religious financing (called 8/1000, "otto per mille", or eight per thousand), the Italian government has the obligation of sending 8‰ ('eight per thousand' or = 0.8%) of the income tax paid by all taxpayers, and taxpayers are the ones who choose in their tax returns which organization can receive the amount -- either an officially recognized confession, or the government's own social assistance programs. As most Italians are nominally Catholic, the largest amount goes to the Catholic Church. "You want to be poor?" says Socci, "be poor then!" Socci is no traditionalist, quite the opposite -- he is even a strong supporter of Medjugorje, and quite happy with his Novus Ordo mass. His extremely harsh words below are absolutely unprecedented for a mainstream Catholic writer in Italy. In a sense, with his words, Bishop Galantino broke a pact of courtesy and conviviality between Bishop and faithful, and Socci has followed his lead, whether we agree with his tone or not . Bishop Galantino, the new Secretary General of the CEI “made up” by Bergoglio in order to oversee and punish [Conference President] Cardinal Bagnasco (“guilty” of not having supported the Argentine prelate in the Conclave) did it again yesterday as he has done in the past. So – if words make any sense – the Church doesn’t welcome funds from the ‘8 per 1000’ anymore. We have to make him happy, even if it’s halfhearted because of the problems that will arise for many good priests who labor heroically in important and excellent missions (and the many works of charity that could close leaving the task of helping the needy to the State). It’s right to fulfill the ardent desires for poverty of Galantino and company, who detest the “privileges” and money given to the Church. Even then, certain people assert that it would be more credible (to go beyond the words) if the Secretary of the CEI would be coherent and propose the actual cancellation of the “8 for 1000’. If we do not choose to give the “8 for 1000” [to the Church], the State will get those funds anyway and perhaps there will be one less tax to pay, (as Ezio Greggio*** would say: “8 for a 1000”? No, no. I am struggling for myself and it’s already hard going”). Once it becomes poor, the CEI will have to make cuts. Even to its TV2000 network (a structure with costs), the daily newspaper “Avvenire”, and the news agency Sir (with 427 employees, among journalists, technicians and management). However, Galantino couldn’t have understood this, as, with regard to the media, he recently summoned several directors informing them that he himself will create “an editorial plan” to put all of the media - with his wise guidance - under only one man. He wants to be in charge of everything. His problem is the seeking of applause at any price. Since the applause of the world comes only when things are said in conformity with the dominant culture, this is why the “little ideological report” is needed: Galantino does it often. Even yesterday. brought to you by the Pope of "certain gatherings"
In his craving to attack militant Catholics (the ones he should instead defend and represent), with his interview to “Regno”, anticipated by some newspapers, he once again threw the battle of the “non-negotiable principles” under the bus, even if they are official Church Magisterium. 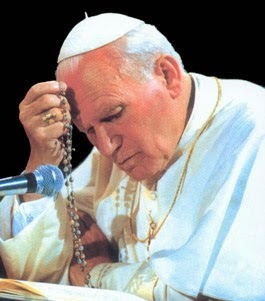 And he rejected “certain gatherings” from the times of Wojtyla, Ruini and Ratzinger. Violence? From the synthesis given by “Avvenire”, it’s difficult to understand what he’s referring to, but more or less, it would appear to be the typical Galantino “blunder.” Despite being in the context of his dispute on the non-negotiable principles, it seems incredible that he may be referring to Catholics, because there are no groups of Catholics that practice violence. On the contrary, Catholics are generally trampled on by the intolerance of other people and Galantino wouldn’t dream of protesting against that. 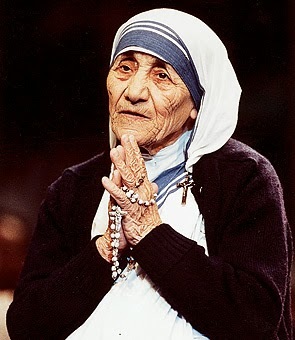 With those words the Secretary of the CEI has unjustifiably offended the great pro-life people who were motivated by Pope John Paul’s magisterium, and examples of saints like Mother Teresa of Calcutta. There was a wave of indignation. Not only because a bishop had never been seen mocking Catholics who pray, not only because those prayers were initiated in Italy by a figure like Don Oreste Benzi – but also because, at times, bishops themselves take part. Moreover, sometimes, the ones who organize these moments of prayer are women who have experienced the drama of abortion themselves. Some of them replied to Galantino with touching words. Nonetheless, the Bishop from Cassano Jonico – now with a ‘subscription to blundering’ – didn’t think of apologizing. On the contrary, last week he launched another one of his bright ideas in his [own] diocese: “We want to apologize to the non-believers because many times the way we live our religious experience completely ignores the sensibilities of unbelievers, and we say and do things that very often don’t reach them, but rather vex them." 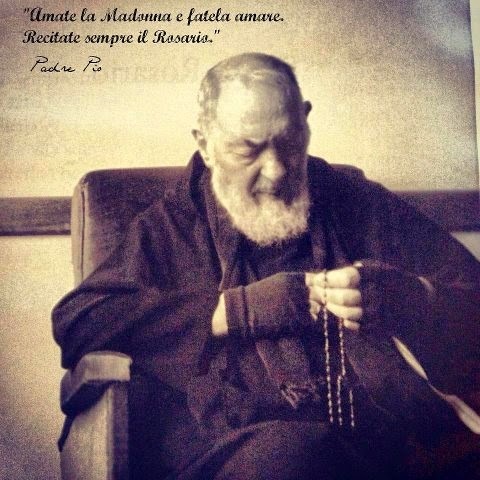 show some sentiment, please, Padre Pio? DOES HE WANT TO BE BETTER THAN JESUS? With this, Galantino intends to show that he is better than Jesus Himself, Who never apologized to the world for coming into it in order to wake it up and “vex” sinners. Rather he claimed: “Do not think that I came to send peace upon the earth: I came not to send peace, but the sword.” (Matthew 10, 34). In fact, Jesus must have created plenty of vexation for unbelievers, since those who became so infuriated finished Him off in such a vicious way. After which others have continued to kill martyrs throughout the centuries, right up until the present day. However, Galantino is not interested in Christian “combat”, and not even in Christian martyrs. With all the “big talk” in our clerical world, not once – these past weeks – have we heard him mention publicly the case of Meriam, the young pregnant mother who is being held in prison in Sudan, was sentenced to 100 lashes and to be hanged, just because she is a Christian and just because she married a Christian. But these things don’t shock Galantino. Yet great testimonies like the ones of Meriam or Asia Bibi will remain for eternity. While “Galantino’s blunders” by midday have already become salad wrapping-paper at the street market. And by we, we mean all of us together. 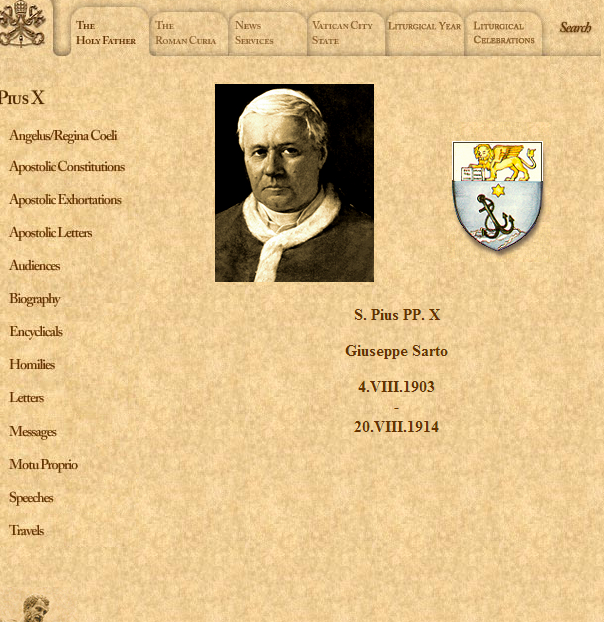 Thanks to our many friends who contacted the Vatican website administrators, who have finally recognized that Pope Pius X is indeed a Saint, following our post last Sunday. It was changed in the past 24 hours. Fr. Brian Gannon, pastor of St. Theresa Church of Trumbull, CT, will be celebrating a Solemn Sung Mass in the Extraordinary Form on the Feast of Sts. Peter and Paul, Sunday June 29th, at 2:30pm. This will be Fr. Gannon's first public celebration of the extraordinary form and the first time in over 40 years that such a Mass will have been said at St. Theresa Church. Deacon for the Mass will be Fr. Shawn Cutler, parochial vicar of St. Theresa Church. A reception, hosted by the parish's young adults group, will follow in the school gym. Directions and maps here. Congratulations to Fr. Gannon and our best wishes! 2. July 7: Pontifical High Mass celebrated by the Archbishop of Santa Fe in Rio Rancho, NM, on the anniversary of the Motu Proprio Summorum Pontificum. Join us on Monday, July 7th for a PONTIFICAL HIGH MASS with the Archbishop of Santa Fe, His Excellency Michael J. Sheehan, in thanksgiving for the promulgation by His Holiness Pope Benedict XVI of the motu proprio "SUMMORUM PONTIFICUM." July 7, 2014 is the seventh anniversary of the release of this motu proprio on July 7, 2007. You are cordially invited to St. Thomas Aquinas Church in Rio Rancho, NM for this historic and monumental opportunity to enter into the Sacrifice of the Mystical Body and give glory to the Most Blessed Trinity. 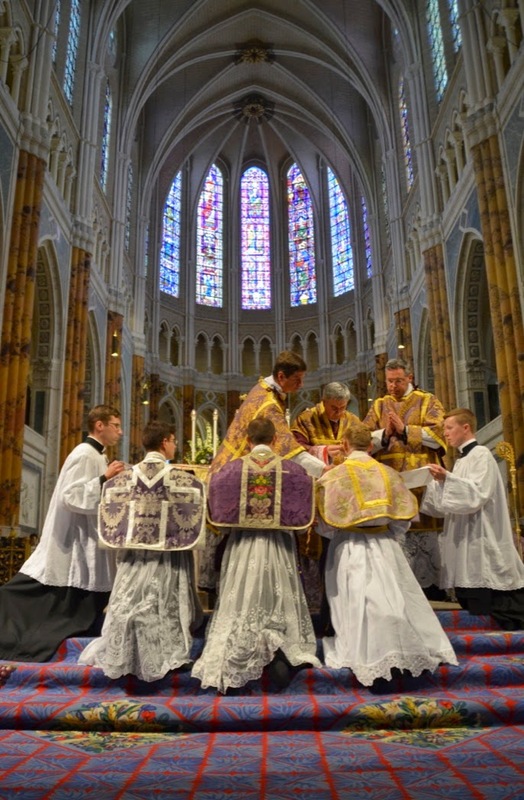 Several priests and brothers from the Canons Regular of St. John Cantius in Chicago will assist with the Pontifical High Mass. Refreshments will be provided afterwards. Address and map here. Congratulations to Archbishop Sheehan for this special celebration of Summorum Pontificum! 3. October 21: Confirmations by the Bishop of Arlington, Virginia. Now, this one is some months ahead -- but, if you live in the Diocese, contact your pastor so that the forms may be sent to the Diocesan Chancery no later than September 30, 2014. The confirmations will be celebrated on October 21, 2014, by the Diocesan Ordinary himself, His Excellency Bp. Paul Loverde, in the Cathedral of Saint Thomas More. Congratulations to Bishop Loverde for his pastoral solicitude! No, we are not always right -- but we try our best to avoid any malice in reporting what we know and how we view things, with the help of the Sol Iustitiae. The report includes a terrible accusation, that one of those present left the "noviciates" (sic) "as he said he was opposed to the II Vatican Council." This absurd statement alone is enough to prove that the report is coming directly from the office of Commissioner Volpi. What is the seminarian's name? Where is his explicit declaration stating this absurdity? What does it even mean to be "opposed to the II Vatican Council"? The Society of Saint Pius X itself, to whom the Friars were nonsensically compared by Commissioner Volpi when he called them "crypto-Lefebvrists", would never state this. If one is speaking of the actual letter of the conciliar documents, the "Progressives" are the ones truly "opposed to the II Vatican Council" when it does not suit them. The accusation would be as absurd as saying that, because a nun left the convent to marry, she is "opposed to Trent"... We can say for sure that this poor young man, no theologian he, simply decided to leave because, as many others, the meeting convinced him that the new, we might say Anti-Manellian, direction of the institute does not suit him anymore. This of course led to the most absurd tirades against us from those moved by the spirit of Oedipus -- Laius is killed, Thebes is shaken to its core, even if they do not quite realize that they are doing it and understand why they do it. Yes, that is right, "as he said he was opposed to the II Vatican Council," the pivotal sentence of the entire piece, was removed after our correction -- pivotal because it displays in the light of day the malice of those who made the report available, pivotal because it provides the basis of the entire false accusation against the Founder, former direction, and house of formation of the Franciscans of the Immaculate, that is, "crypto-Lefebvrism". 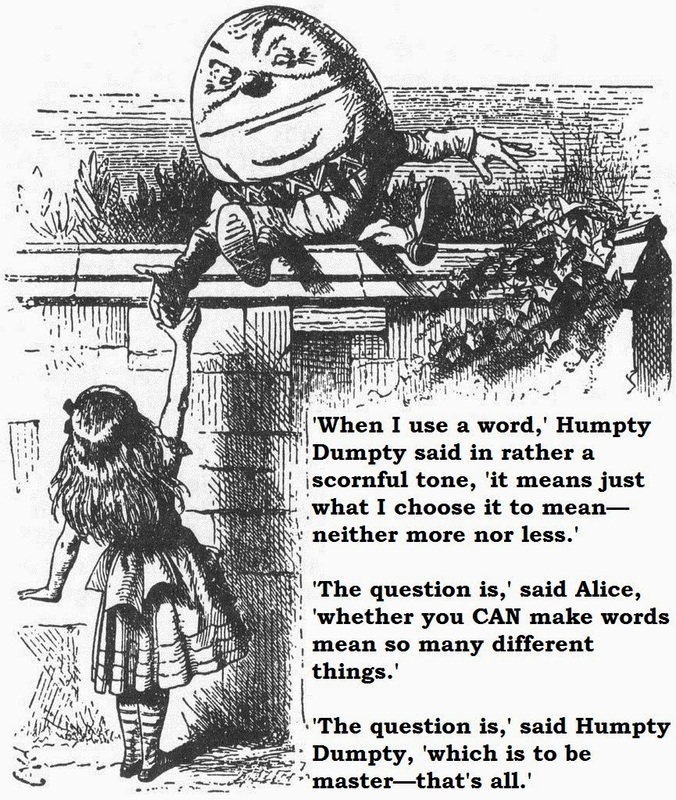 This word is nothing, it means nothing, it has no theological meaning, it is a handle that allows some to say "it means whatever I think it means," and is as empty as the accusations of mental illness made by Soviet apparatchiks against those opposed to the regime. This unjustified heavy-handedness from above is the exact opposite of all that is in the documents of Vatican II, and can only be justified by what Marco Tosatti calls, "the cruelty that is typical of closed environments." Tosatti is right, cruelty is all that is left of those who, under disguise of goodness, appealed to have the Traditional Mass banned, seminary closed, and superior general placed under confinement: "A goodly apple rotten at the heart: o, what a goodly outside falsehood hath!" [**] Italian original text on June 25: "Alla fine dell'incontro il Papa ha salutato personalmente tutti i presenti. Due di loro gli hanno manifestato perplessità per il trattamento a cui è stato sottoposto il fondatore padre Stefano Manelli. Uno di questi due seminaristi alcuni giorni dopo l'incontro ha annunciato la sua decisione di lasciare il noviziato." "In the Catholic Church, it's now Open Season on Conservatives"
That is the title of the most recent post of the most experienced, and of the most influential, Vaticanists in Italy -- Marco Tosatti, the senior religion writer for La Stampa. We hope to be mistaken, as it often happens, fortunately; but the impression we have from a series of small signs is that, in reality, the Church of Pope Francis has opened hunting [season] on "conservatives"; a word that, as always in such cases, is sufficiently generic to be used against a wide range of persons. The most striking case remains that of the Franciscans of the Immaculate, an order intervened by [higher] authority with extremely harsh procedures, and without clear motives ever having been given, except a generic indictment of a Traditionalist drift. I confess that, before their decapitation, the Franciscans of the Immaculate did not have a position of any relevance in my life; good Catholics, people -- certainly not traditionalists -- linked to the Church now speak well of them to me; others signal certain eccentricities, or excessive personalisms of the founder (but how many order founders, ancient or recent, do not display these excesses?). Czech bishop Jan Graubner, speaking about the audience of past February 14, declared to Vatican Radio: "When we were discussing those who are fond of the ancient liturgy and wish to return to it, it was evident that the Pope speaks with great affection, attention, and sensitivity for all in order not to hurt anyone. However, he made a quite strong statement when he said that he understands when the old generation returns to what it experienced, but that he cannot understand the younger generation wishing to return to it. "When I search more thoroughly - the Pope said - I find that it is rather a kind of fashion [in Czech: 'móda']. And if it is a fashion, therefore it is a matter that does not need that much attention. It is just necessary to show some patience and kindness to people who are addicted to a certain fashion. But I consider greatly important to go deep into things, because if we do not go deep, no liturgical form, this or that one, can save us." There could be some argument on this point. Also by observing which religious orders gather more favor among the young, from the point of view of vocations. But what matters to us only is to observe that perhaps those who ascribe to the Pope little fondness for that world are not mistaken. And, in the Curia, which is nevertheless always a Court, even if the Sovereign, instead of living in his Apartments, lives in the barracks of the King's Musketeers, there is great ability in sensing this atmosphere. And to act accordingly. Therefore, there are reports of priests judged too conservative by their own orders to whom it was not granted to profess those particular vows typical of their own order; promotions -- and demotions -- in the dicasteries of the Curia, judged based on the "progressivism" or "conservatism" of those interested. Even reaching possible decisions at a much higher level, related to the relocation of Cardinals considered "conservative" to mid-level dioceses, instead of greater positions [lit. ad maiora]. One of the latest news comes from New York, where a South African priest, attaché to the Holy See’s Mission to the United Nations, deeply attached to the Mass according to the Ancient Rite (the Mass in the Extraordinary Form), delivered a sermon in which he underlined the need to have priests who had love and sensibility for the Ancient Rite. The homily appeared on the Internet. After which the priest was dismissed from all his Mass-celebrating obligations, and it seems he will soon return to South Africa. Small things, but which when woven together form a fabric. The impression is that the work accomplished by Benedict XVI to give citizenship back to various sensibilities within the Church is about to be cancelled. What a shame! It was in fact Vittorio Messori, a long time ago, that the Catholic Church is based on the et-et [and-and: and the one, and the other], on the living together of Catholics who are diverse, but united, while the sects are the ones that practice the aut-aut [either-or: either the one, or the other]. Pope Bergoglio certainly does not want a Church of the aut-aut; but perhaps there is a problem of "Bergoglistas", by conviction or by opportunism, who think they will meet his favor. Another kind of "Reform of the Reform"? 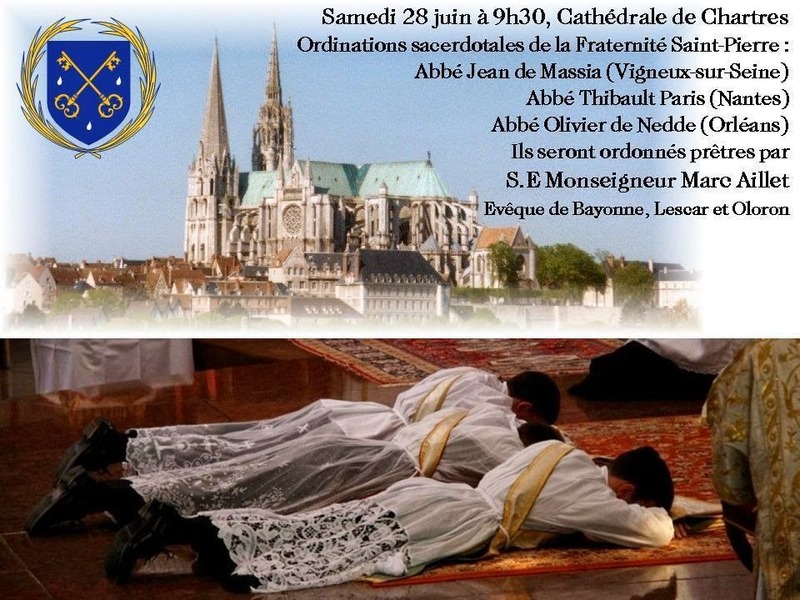 The "homily" ["homélie"] (that is what it is called) begins soon after 23:40 -- the entire ceremony is in French, naturally. Not that the bishop, who gave her the "mandate for preaching," is unaware of it. Just a couple of weeks later, in a confirmation ceremony, there was Madame Lachat one more time, vested with her alb next to all local priests and deacons. Is this a rupture with the entire Tradition of the Church? Yes. Is it disobedience to all norms regarding preaching in a liturgical setting? Yes. Will anything be done about this? Of course not : in the name of "progress", all norms, of divine or human institution, Tradition, and traditions can be violated. Whoever does not see the beauty in all of it is simply a "reactionary" who "does not accept Vatican II" -- even if the conciliar documents say absolutely nothing that would ever allow for this anti-Catholic practice. And that, "reaction", is what should be punished and restricted, even if it only means wanting to worship as the Church always worshiped. 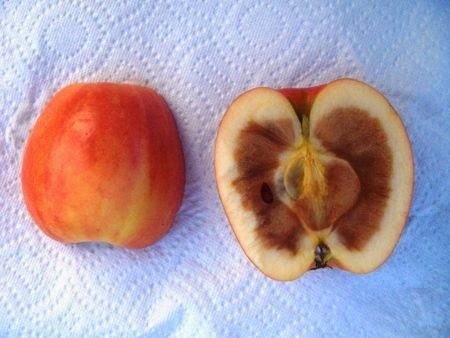 Fuit homo missus a Deo, cui nomen erat Ioannes. A happy St. John's Day to all our readers, wishing you and yours joyful celebrations of Midsummer (or Midwinter, for those in the Southern Hemisphere)! A Happy "Second Christmas" to all! What happened on June 10? 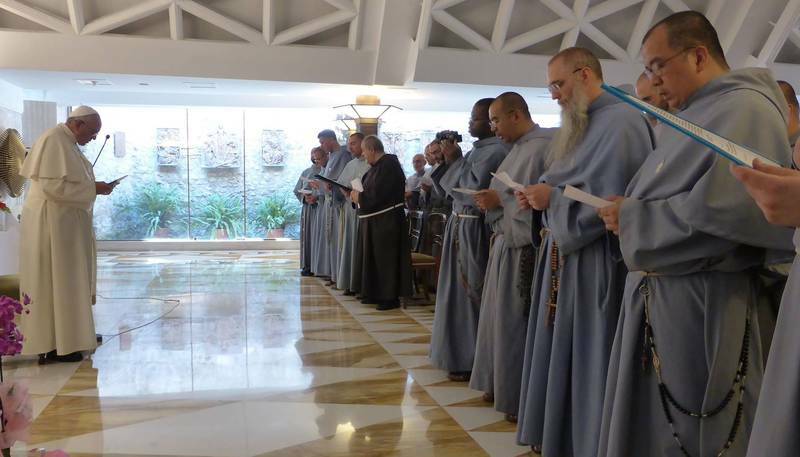 Two weeks ago, Pope Francis received around 60 [typo corrected] members of the Franciscans Friars of the Immaculate, along with the commissioner appointed by the Congregation for Religious for the intervention on the FI, Capuchin Father Fidenzio Volpi. Though it was a large and scheduled meeting, it was kept in secret and unrecorded in the Vatican official media. Silence from the official sources. Oddly enough, it was only made public today, along with a photograph, still not by Vatican Radio, L'Osservatore Romano, or the Holy See Press Office, but by La Stampa (full report below) -- one of whose journalists has been acting as a kind of unofficial spokesman of the Volpi Intervention since July 2013. In such cases, the Holy See Press Office usually comes out to clarify something -- after all, it is a large meeting, on a very delicate matter, and some points may be obscured by the report, but that has not happened. Why? That is not the usual Vatican modus operandi. What is strange about the report on the Traditional Mass and Summorum? It is that if it reflects the whole sentiment of the Pope, then the intervention should never have even happened. The Traditional Mass was not "part of the founding charism" of the Friars? Who did not know this? But if it is understood as a right of all priests of the Latin Church -- which is the whole purpose of Summorum Pontificum -- then it makes sense that priests with a traditional sensibility (as the Franciscan Friars always were) feel attached to it. In any event, it was never the Mass celebrated exclusively by the Friars, and no faithful who ever went to any Traditional Mass ever celebrated by the Friars ever heard anything against the Paul VI Mass; quite simply because it was never an ideological banner, but a sign of liturgical sensibility. The precedent of the intervention regarding the curtailing of the rights recognized by Summorum Pontificum, the need for a prior "authorization by the superiors" (an authorization that, Rorate has learned, has gone unanswered or denied to the immense majority of those who explicitly asked for it) remains grave. Other than the very small proportion of priests ordained for institutes under the Pontifical Commission Ecclesia Dei (fewer than 1000 out of over 410,000 priests), the excuse of the Traditional Mass not being their specific "charism" or of "ideological manipulation" can be used in the future to curtail the rights of any priest of the Latin Church, except (perhaps) those of the Ecclesia Dei institutes (for whom, strictly speaking, Summorum Pontificum was a very good thing, but legally unnecessary). So despite the papal assurances, this intervention remains and will remain an enormous shadow over the application of Summorum Pontificum. Of course the Pope will not alter the text of Summorum Pontificum -- but this is a Pope for whom texts are not as important as what he understands to be the needs of the Church required by the spirit of the times. What is strange about the report on theology and the Theological Institute of the FI? Second, and most strangely, if there was one --a single one-- institute in the Catholic Church working to try to implement the vision of Benedict XVI regarding the Council it was the Franciscan Friars of the Immaculate. It is scandalous that their Theological Institute was shut down and that the decision is defended by the Higher Authority. Is there a sign that it was propagating heresy, schism, apostasy? Where is the evidence? If it was, there are two congregations of the Roman Curia ready to study the matter in its educational (Congregation for Catholic Education) and in particular doctrinal (Congregation for the Doctrine of the Faith) points of view. In the history of the Institute, it is clear that the call to help bridge any apparent differences between Vatican II and the preceding Magisterium came only after the public call of Pope Benedict XVI in his December 22, 2005, address to the Roman Curia. So any true investigation would find nothing at variance with Catholic Doctrine. Can it really be said, defended, by anyone who sees daily what is taught and defended in most Catholic universities, seminaries, schools that the priority is to shut down a small theological institute led by friars whose orthodoxy and morals were never in question? Let us admit, for argument's sake, that this institute was promoting heterodoxy and heresy: is it not strange that the patience shown to every single heretic in the past few decades, with dissident universities, with dissident theologians, simply did not apply to these friars? So, how is the orthodoxy of the Friars' formation guaranteed? Well, they can go to Pontifical universities and seminaries, and the simple fact that these seminaries are under the Pope is a "guarantee" of their "orthodoxy"... We can almost see many readers bursting out laughing with this assumption. Even this sugarcoated report cannot, however, hide the truth: in an institute with under 400 members, about 40 have already explicitly asked for release of vows, over 12%, half of them seminarians. In less than one year! And of course many more will do so, or are just waiting for the best moment to do so. The report includes a terrible accusation, that one of those present left the "noviciates" (sic) "as he said he was opposed to the II Vatican Council." This absurd statement alone is enough to prove that the report is coming directly from the office of Commissioner Volpi. What is the seminarian's name? Where is his explicit declaration stating this absurdity? What does it even mean to be "opposed to the II Vatican Council"? The Society of Saint Pius X itself, to whom the Friars were nonsensically compared by Commissioner Volpi when he called them "crypto-Lefebvrists", would never state this. * If one is speaking of the actual letter of the conciliar documents, the "Progressives" are the ones truly "opposed to the II Vatican Council" when it does not suit them. The accusation would be as absurd as saying that, because a nun left the convent to marry, she is "opposed to Trent"... We can say for sure that this poor young man, no theologian he, simply decided to leave because, as many others, the meeting convinced him that the new, we might say Anti-Manellian, direction of the institute does not suit him anymore. Perhaps the time has come for His Holiness to finally give up on the wrong intermediaries, who have certainly not told him the correct information, and personally meet the founders of the Institute, in particular Father Stefano Manelli? That is the wish behind this petition. We pray the Holy Father will give them a chance to hear their version of the facts. We will have more to say shortly. Below, the text published by La Stampa (which, as we mentioned above, should be understood as a press release of the Commissioner). The meeting was held on Tuesday 10 June in the chapel of the Santa Marta Residence in the Vatican, despite the fact the Pope had been feeling under the weather and cancelled some appointments the previous day. For an hour and a half, Francis entertained around sixty Franciscans of the Immaculate, the order founded by father Stefano Manelli that last year the Holy See put under temporary receivership to resolve internal differences regarding the government, administration, relationship with the female branch and the use of the by new exclusive old missal and the interpretations of the last Council. Around forty seminarists, novitiates, and theology and philosophy students were present, along with their teachers and the pontifical commissioner, father Fidenzio Volpi. The Franciscan Friars sang the Ave Maria di Fatima and renewed in the hands of the Pope their vows of total consecration to the Immaculate. Questions were then put to Francis on the most contested themes regarding the internal operations of the institution. Pope Bergoglio proved to be well informed on all issues, following the matter closely, and several times showed his appreciation for father Volpi, quelling rumours that the actions of the government of the commissioner and his collaborators were undertaken without the Pope’s knowledge. 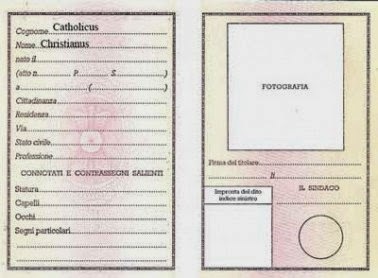 Following the assignment of commissioners and restrictions applied to the use of the old missal, which, as opposed to what happens under motu proprio “Summorum Pontificum”, in the case of the Franciscans of the Immaculate it can be used without prior authorisation from superiors, there were defections in the friars and the seminarists. Of 400 members in the world, around 40 have requested to be released from their vows, and around half of these are seminarists and therefor still students who had only made temporary vows. On the motu proprio, Pope Francis said he did not want to deviate from the line of Benedict XVI, and reiterated that the Franciscan Friars of the Immaculate remained free to celebrate the old mass, even if for the moment, in light of the controversies surrounding the exclusive right to use that missal – an element that did not constitute part of the founding charisma of the institution – they required “a discernment” with the superior and with the bishop if it concerned celebrations in parish churches, sanctuaries and teaching houses. The Pope explained that there must be freedom, both for those who wish to celebrate with the old rite, and those who wish to celebrate with the new rite, without the rite becoming an ideological banner. One question concerned the interpretation of the II Vatican Council. Francis once again expressed his appreciation for the work of Archbishop Agostino Marchetto, defining it as “the best hermeneutic” of the Council. He then responded to the objection according to which the II Vatican would only be a castoral council, which has damaged the church. The Pope said that although it is has been pastoral, it contains doctrinal elements and is a Catholic council, reaffirming the line of the hermeneutics of reform in the continuity of the one-subject church, presented by Benedict XVI in his speech to the Roman Curia in December 2005. He then reminded them that all councils have provoked uproar and reactions, because the demon “does not want the church to become strong”. He also said that we must move forwards with a theological and not ideological hermeneutic of the II Vatican. Francis also said that he had wanted the closure of the theological institute within the Franciscans of the Immaculate (STIM), so that the seminarists would study in the pontifical theology faculties of Rome. He then explained that the Church guarantees orthodoxy through the Pope. As usual, Bergoglio recounted some of his personal memories, speaking about brother Anselmo, a Franciscan Friar of the Immaculate originally from the Philippines who he met as a cardinal attending the church of Maria Santissima Annunziata on the Lungotevere, where he met him for the first time with a bucket in hand as he did the cleaning. Brother Anselmo is now in Nigeria. “He taught me humility, he did me a lot of good”, said Francis. At the end of the meeting, the Pope said goodbye to all participants individually. Two of them expressed their bafflement over the treatment of father Stefano Manelli. One of these two seminarists a few days later announced his decision to leave the noviciates as he said he was opposed to the II Vatican Council. *As Dr. John Lamont wrote last year, "The FSSPX does not reject Vatican II in its entirety: on the contrary, Bishop Fellay has stated that the society accepts 95% of its teachings. This means that the FSSPX is more loyal to the teachings of Vatican II than much of the clergy and hierarchy of the Catholic Church." 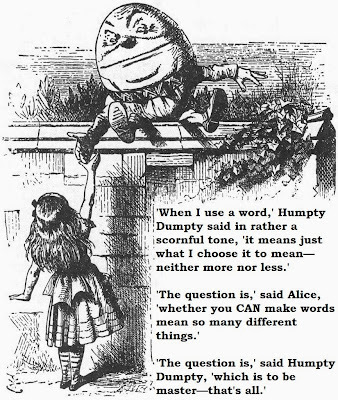 † Or paraphrasing, but the reference is exact and obviously is that of the Spiritual Exercises, in which Saint Ignatius says, in the 13th rule of true sentiment in the Church Militant: "To be right in everything, we ought always to hold that the white which I see, is black, if the Hierarchical Church so decides it." "On the Franciscans of the Immaculate. Both the Commissioner, Fr. Volpi, as well as all seminarians of the Franciscans of the Immaculate, were received by the Holy Father on June 10, in Domus Sanctae Marthae. A gesture that shows the interest with which Pope Francis follows the situation of the Franciscans of the Immaculate and his closeness to the work being done by the Commissioner in the name of the Congregation for the Institutes of Consecrated Life and Societies of Apostolic Life [Congregation for Religious]. The Holy Father is informed with exactness of all steps that are carried out. In this moment, a house is being searched in Rome where the student friars of said Institute who will attend a Pontifical University of Rome to carry on their studies may live."